Arrive in Yangon, the hustling & bustling capital of Myanmar, the city today still maintains its colonial charm and gracious turn of the century old architecture. 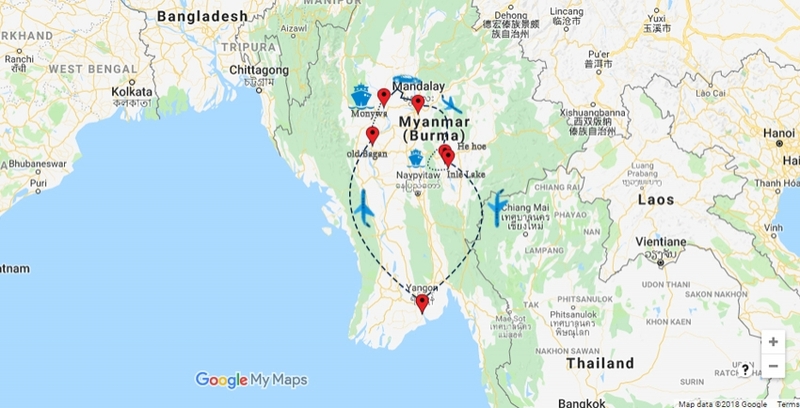 You will take a full day tour of wonderful pagodas including world famous Shwedagon Pagoda You will then fly to Bagan, situated on the eastern bank of the Ayeyarwaddy River, which covers more than 17 square miles and more popularly known as the “city of four million pagodas”. Take a boat to Monywa, and enjoy the local market at Pakokku. Continue to Mandalay, the last capital of royal Burma, which is still one of the largest cities in Myanmar, and a cultural and spiritual center. You will then fly to Heho and drive to Inle lake, an area of outstanding natural beauty. The lake itself sits at a pleasant 4,260 ft. above sea level and is famous for its leg rowers. Floating markets and prolific bird life, colorful hill tribes, inhabit fertile valleys, forested mountain tops and friendly people make this one of the must see in Myanmar. Before you return to Yangon, you will also visit Kalaw, a popular hill station during the British days. Day 07 Fly Mandaley Heho, - drive -boat to Inle Lake. Upon arrival in Yangon, you will be met and transferred to hotel. Rest of the at leisure to go through jet lag, or you can just explore around the down town. Chaukhtatgyi Paya :The reclining Buddha at Chaukhtatgyi is almost as large as the enormous figure in Bago. It's housed in a large metal-roofed shed on Shwegondaing Lan, only short distance north-east beyond the Shwedagon Paya. Surprisingly,this huge figure is little known and hardly publicized at all. Botataung Pagoda: This was named after the 1000 military leaders who escorted relics of the Buddha brought from India over 2000 years ago. This ancient monument was completely destroyed during WWII. It was then rebuilt in a very similar style to its predecessor. Visit Bogyoke Aung San (Scott) Market (closed on Mondays), also known as Scott Market, this building contains over 2000 stalls and is the best place in Yangon to browse through the complete range of local handicrafts. Visit Shwedagon Pagoda at sunset, the highlight of any visit to Yangon. This pagoda towers over the city and is the most sacred spot in the country, built to house eight hair relics of the Buddha. The Shwedagon and surrounding shrines are particularly beautiful during the sunset hour, as the golden Stupa reflects the changing colors of twilight. Transfer to airport and fly to Bagan. You will be met by your local guide at the airport and you have a full day tour of Bagan. Today's tour includes Shwezigon Paya: King Anawrahta started the construction of the Schwezigon Pagoda to enshrine some relicts of Buddha. The construction was finished by his successor, King Kyansittha between 1086 and 1090. Originally the Shwezigon Pagoda marked the northern end of the city of Bagan. The stupa's graceful bell shape became a prototype for virtually all later stupas over Myanmar. Ananda Pahto : one of the finest, largest, best preserved and most revered of the Bagan temples. Thought to have been built around 1105 by King Kyanzittha, this perfectly proportioned temple heralds the stylistic end of the early Bagan period and the beginning of the Middle period. Shwesandaw Paya: In 1057 King Anawrahta built this Pagoda following his conquest of Thaton. This is the first monument in Bagan, which features stairways leading up from the square bottom terraces to the round base of the Stupa. This Pagoda is ideal to watch Bagan's magnificent sunsets. Lacquer ware Workshop: the villages around Bagan are known for producing the finest lacquer ware in Myanmar. Stop by one of the workshops and learn about the painstaking process of lacquerer making and decoration. Morning Bagan to Pakkoku by boat. Explore the bustling town of Pakokku, with a visit (perhaps by trishaw) to the local market and a stop to the cheroot factory, where visitors can observe the manufacture of this typical kind of mild Burmese cigar. Drive to Monywa, situated on the eastern bank of the Chindwin River, Monywa is now the second biggest town in Upper Myanmar and serves as a major trade center for agricultural produce from the surrounding Chindwin Valley, especially beans, pulses and palm sugar. Thanboddhay Paya: Every spare surface of this temple, inside and out, is covered with thousands of miniature Buddha images (almost 600,000 altogether); the cumulative effect is spectacularly colorful. Boddhi Tataung: A grove of banyan trees with a Buddha image at the base of each one. Drive from Monywa to Mandalay. En-route visit Pow Win Daung : this mountain contains a series of caves set in the hillside along a meandering path and contains Buddha images and beautifully preserved murals dating from the 14th-16th centuries. Shwe Ba Taung Paya: Shrines and pavilions are carved into the sandstone hillside here, colorfully decorated with mosaics and Buddha images. Whimsical sculptures adorn the path and walls, such as a giant golden frog sitting by the road or an elephant carved to form a temple doorway. Cross the Chindwin River by local ferry and continue east towards Mandalay. Sightseeing in Amarapura and Mandalay. In the morning, head to Amarapura, also a former royal capital, and visit Mahagandayon Monastery; in the morning, monks and novices line up to receive their daily offering of alms and food from faithful Buddhists. Enjoy the atmosphere of U Bein's Bridge, a picturesque teak bridge which extends over one kilometer across Taungthaman Lake, and the highlight of any visit to Amarapura. Visit Mahamuni Paya. The Mahamuni image enshrined here is perhaps the most venerated image in Myanmar, covered in over 15 cm of gold leaf. Worshippers flock daily to the shrine at four in the morning to observe the unique face-washing ceremony. En- route to the pagoda, stop to observe the laborious process of Gold-Leaf Beating, where gold is painstakingly hammered out into tissue-thin squares. Continue to Shwenandaw Kyaung , or the Golden Teak Monastery. Built entirely of golden teak, this intricately carved wooden monastery was once part of the Mandalay Palace, used as private apartments by King Mindon and his chief queen. Afterwards visit Kyaukawgyi Paya, famous for its monumental seated Buddha, carved from a single block of marble, and the elegant Sandamani Paya. The final stop is at Kuthodaw Paya, known also as "the world's biggest book". Around the central stupa are miniature pavilions, each housing a slab of marble. Numbering altogether 729, these slabs are inscribed with the entire Tripitkata, or Buddhist scriptures. Visit Mandalay Hill at sunset. Inle Lake: located in Shan State, is beautiful, with very calm waters dotted with patches of floating vegetation and fishing canoes. High hills rim the lake on all sides. The lake's shore and islands bear 17 villages on stilts, mostly inhabited by the Intha people. Enjoy the spectacular scenery and observe the skilled fisherman using their leg-rowing technique to propel themselves around the lake. Taking a boat trip along the lake to see local life with opportunity to see the way that fisherman row their boats while standing on one leg. Enjoy visiting various villages and seeing kids returning home from the school on the boat. Visit the floating gardens, a market and a Intha village around the lake (please note that no markets take place on full moon or new moon days). The day sightseeing also includes a visit to the Phaung Daw Pagoda, Inn Paw Khon Village (Lotus and silk weaving) and the Nga Phe Kyaung Monastery. Transfer by boat, then to Kalaw by vehicle. Sightseeing in Kalaw with a moderate trek to nearby villages (about 4 hours trek), which was a popular hill station in the British days, Kalaw sits high on the western edge of the Shan Plateau. It is still a peaceful and quiet place with an atmosphere reminiscent of the colonial era. The small population is a mix of Shan, Indian Muslim, Bamar and Nepali. You will also visit Thein Taung Paya: temple perched on the hill overlooking the Thazi-Taunggyi Road. Aung Chang Tha Zedi: glittering stupa (Buddhist religious monument) covered in gold-colored mosaics. Dhamma Yon: a two-floor temple which from upstairs has fair views of the town, Dhamma Yanthi Paya and the ruins of the Hsu Taung Pye Paya. Also visit Nee Paya : located west of the town, it features a gold lacquered bamboo Buddha. Christ The King Church: a brick Catholic church under the supervision of the Burmese Father Paul, and the Italian Father Angelo Di Meo, who have been in Myanmar since 1931. The Christ figure over the altar came from Italy, and Father Angelo painted the mural background. Drive from Kalaw to Heho with sightseeing at Pindaya. Later take a flight from Heho to Yangon. You will be met and transferred to hotel. Transfer to airport and fly back to U.S. or extend your trip to Thailand, Laos, Cambodia or Bhutan. All application local and government taxes. Air U.S. - Yangon- U.S. The trip is guaranteed even with the sign-up of the minimum of two people. The price shown with departure date is guaranteed once you send us a trip application form with a deposit of $350.00. Otherwise, it may change until we receive the trip applications form. Yes, you need a visa for Myanmar. You can apply and get online evisa, which is easy. Just go to https://evisa.moip.gov.mm for visa. All the permits and entrance fees are included in the trip. Winter is the best time to travel to Myanmar which is from November to February. The weather generally stays nice and sunny during the period, and the the chance of rain is very low. This is an easy trip. However, you have to be physically fit to do this trip. You will be spending from around 9 AM to 4 PM touring around, going from one place to another taking scenic drive and enjoying the world famous monuments/heritage sites here and there. You will be staying in nice, comfortable accommodation with attached bath. Your breakfast is always included. Your guide can help you to buy lunch and dinner. A decent meal will cost you about $ 8-12 in tourist class restaurant. If you like to upgrade it to higher end hotels, that is also possible with additional price. We provide experienced driver and English speaking local guides during the tour. You will be traveling in comfortable private Car or van or mini bus with driver and guide depending on the number of people in the group. Yes, you can extend your trip to Thailand, Laos, Cambodia or Bhutan or other destinations in Asia. You may like to inform this at the time of booking the trip, should you book the international flight with us. We would be happy to arrange your extension as well.